I turn thirty in August and apparently most of the people around me have magical powers to hear my biological clock ticking. I'm in my fourth year of marriage now and child free. At times I'm not even sure if people actually sympathize with me or are envious of me. As a child when we used to play house-house, I always chose to be the lady with no baby. Most of my friends would bring their dolls and treat it like their baby, but I always wanted to be a non-mother. The only way these "babies" could make their way in to my "house" was only if I invited their "moms" over. Long story short, I did not want to have a baby even back then. Even if it was only a game. Before people jump into conclusions, let me tell you this; I actually do like kids. I am a very good aunt to my nephews and nieces and recently my tiniest friend gave birth to the tiniest niece and I'm so in love with her already. I love kids who are naughty and bratty. Silent and weepy kids are not for me. So yeah, I do like kids. I also like Lions, doesn't mean I get one of my own right? I have thought about being a mother and the only thing that came to my mind was how I did not want to be one. I'm not too sure if I have a maternal instinct within me, but I know for sure that I do not want to have a baby of my own. This is how I have felt since I was child till until now. Will I change my mind later? Maybe. Maybe not. So why don't I want to be a mother? Because I just don't want to. I have never felt the need for a child in my life. When people say that you only know happiness when you've had a child, I respectfully disagree to it. I find happiness in the smile of my parents and in the eyes of my husband. I find happiness when a new recipe turns into a delicious dish. I found unadulterated happiness when I married the man I love. Also, through the course of life I have learnt to find happiness within myself. I do not need to look for it in someone else. And I definitely do not want to create a person and look for happiness in them. My life is already complete and I do not want to bring another person to this world to feel complete. My husband also shares the exact same views. Both of us are very busy and are very happy with the life that we lead together. As selfish as it sounds, we do think that a child might not let us spend as much time together as we normally do. I have seen and heard of cases where parents have an unplanned baby and blame the baby for the rest of their lives. I also have heard of parents ill treating the child when they do not know what to do with them. I'd rather not be a parent than be such a parent. I am an ambitious woman and for now the only priorities I have in life are my work, my home, my writing, my husband, a handful of friends and my parents. I do not want someone in between all of this. Be it another person or a child. Having said that, if I were to have a baby, I know that I do not have a strong support system. My mother is a working lady and I do not want the burden of taking care of my baby to fall on her. I want her to do what she loves and she is very good at her job. I do not want her to let go of it for me or my baby. I hate this concept of the girl's parents taking care of their pregnant daughter, her delivery and then their grandchild. Makes no sense to me at all. I love my work too much to just quit and take care of the baby. If a day comes when I feel that I'm ready to quit my job and take care of a baby, maybe I'll do it. Even if it means that I'm going to be a late parent, I do not care. A child should be welcomed into the world by his/her parents. It needs to be wanted. They should not just come into the world because his father forgot to wear a condom or her mother forgot to pop the pill. If I think that I'm not ready to be a mother, then I would not be one. I'd rather not be a mother than be a lousy one. For now, I have a million things on my bucket list and a baby is not even the last of it. It doesn't feature anywhere in my life and I'm very happy about it. If people think that I'm being selfish and stupid, then so be it. It's my life and my body. I have the right to choose what I want to do with it. I do not need to have a baby to feel worthy of myself. I'm awesome and I know that. And that's all that matters to me. wow, impressed, as i also have the same thought about(not) having a baby i have heard that their is less probability that any girl will agree to marry me, after reading this post and about both of you, i have got hope---people are there who think like me.thanks for sharing. It is a decision that only you and your husband should make and it must be a carefully thought out decision as you have pointed out. As long as you are clear about what you want, it's no omg else's business. I like your point- "I also like Lions, doesn't mean I get one of my own right?" A baby comes with responsibilities and parents must go for a baby when they feel comfortable and are ready to handle. Hope the society and everyone respects their personal decision. Makes sense in a way. Why have a child in your life, when you can't manage to take time out and be there for him/her always? Yes, definitely it is upto one'w own self whether to have kids or not to. I had writtena bout this in one of my blog posts; I mean as to whether marriage and having kids after that are the only goals of life. I definitely agree that one should have a baby only when they want one. Society norms do not matter ! Total respects to your decision. And I’m really proud of you on not wanting to burden u'r mom with your babies in case you have one. Hats off to a daughter like you!! !I got married early into a joint family and had very high pressure from my in-laws to have a baby in barely 2 months after marriage. I was a prisoner who was abused in that house. I didn’t give in to it immediately though. In 3 yrs post marriage when i delivered my parents were dragged into everything by them. After all my parents did to help me my mother in law would only find flaws and abuse my mom. My parents too felt it’s their duty to do this and bear up with crap becoz they are the "GIRL's Parents”. I am as educated as my husband and financially independent didn’t matter to anyone. Thankfully I used the guts to move out of my in-laws home even against my own parents wishes. Of course you are right. Think of a child only when you are ready for it. It is a full time responsibility. 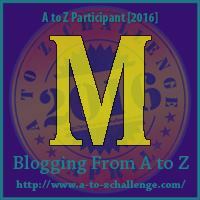 Stopping by on the A-Z Challenge to say Hi :) A well thought out piece and I would hope that no-one would judge you for not having a child. It is totally your own choice and that of your husband and you are obviously happy and as you say unfortunately there are so many children born who are not wanted or loved which is a terrible thing in today's world. It's your life gal n you have full right to live it your way. I strongly believe in this thought. Thanks for sharing. Noone should tell you to have a baby or when to have one. It should remain a personal choice.